Sports themed embroidered appliques on the flat sheet hem. 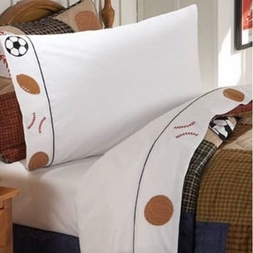 Set includes flat, fitted, and two pillowcases (one pillowcase with the Twin set). Note: For a comparable sheet set in a Full size, please search for "All State" bedding.